The Butterflyfish Chaetodontidae family consists of a large and diverse group of individual species that eat a wide variety of marine life in nature. From zooplankton to tiny motile crustaceans and mollusks, to all types of soft and stony corals, anemones, fan or tubeworms, other soft and encrusting sessile invertebrates associated with live rock, as well as being opportunistic marine fish flesh eaters, overall Butterflyfishes are considered to be carnivores. However, some species are omnivorous feeders that primarily feed on marine algae as well as some meaty fares, while others are "strictly" obligate corallivores. Unless otherwise noted in individual species profiles, most all Butterflyfishes can be fed a varied diet of vitamin-enriched marine fish, crustacean, and mollusk flesh, mysid shrimp, and any appropriate frozen preparations suitable for carnivores. Because these fish have small mouths, all meaty fares offered should be finely chopped. For specific omnivorous species, such as Chaetodon mertensii, punctatofasiatus, quadrimaculatus, and unimaculatus, live algae, vitamin-enriched vegetable matter, Spirulina, nori or other suitable preparations for omnivores should be offered. Although you may see other Butterflyfishes nibbling on these foods, they are not primary to their diets. Algae is something they incidentally ingest while intentionally eating crustaceans and other generalized invertebrates that reside or hide in it. At least 3 times a day. Chaetodon austriacus, baronessa, bennetti, larvatus, lunulatus, meyeri, octofasiatus, ornatissimus, rainfordi, and trifasicatus are all species that are suggested not be kept in captivity, or only by an aquarist that is well experienced. These Butterflyfish are dependent on a specialized diet of live coral polyps, which are nearly impossible to duplicate in the usual home aquarium environment. Unless you can provide them with the proper diet, in all likelihood they not survive. Be careful with Chaetodon speculum, as this species comes very close to falling into this category. In the wild, this Butterflyfish almost exclusively feeds on stony coral polyps and coral mucus. It is not unusual for small juveniles and large adults to shun aquarium food substitutions. 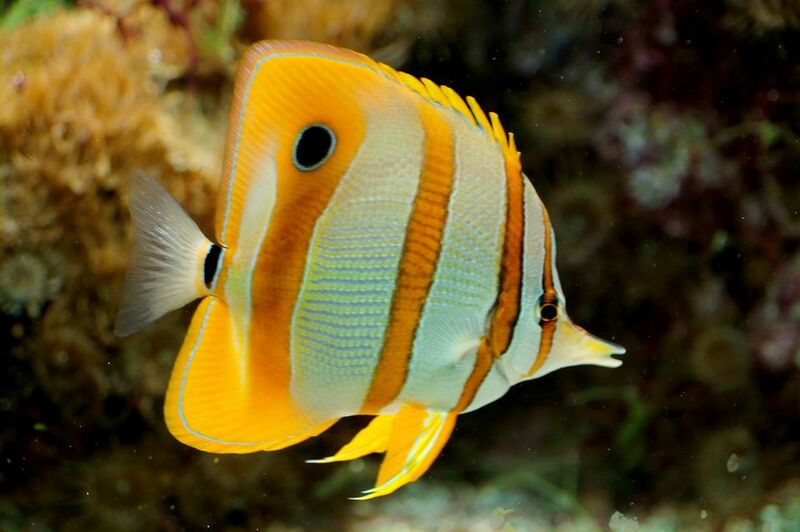 This fish requires a non-aggressive fish tank community with a least one other hardier Butterflyfish species present to encourage its feeding behavior. Because fish in the Chaetodontidae family eat such a wide variety of soft and stony corals and other sessile invertebrates, "overall" they are not considered to be suitable for reef aquariums. For more information on what types of corals a particular Butterflyfish species should or should not be kept, as well as learn about other specific dietary preferences and characteristics one may have, read our individual Butterflyfish Species Profiles.